Imagine you’re a caregiver examining a patient and documenting the care being provided into her EHR. During this process, you realize this visit is similar to one earlier in the day. To save time, you might reuse—or copy and paste—portions of the previous patient’s documentation. It may be convenient but, by employing this shortcut, you run the risk of committing fraud. 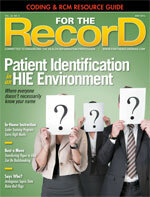 The fraudulent use of EHR systems is a source of continuing discussion and debate throughout the health care industry. A recent report by the Office of Inspector General warned that the government isn’t taking enough precautions to eliminate potential fraud and abuse in EHR systems. The federal oversight agency especially was critical of the limited guidelines for the copy-and-paste function available in many EHRs. Copying and pasting information from one medical record to another can lead to documenting more extensive (and possibly more expensive) treatment than actually occurred. Multiple records that look nearly identical often can appear to be fraudulent. With the risks involved in copying and pasting, what drives health care providers to use the function in the first place? Are providers intentionally committing fraud or is it a matter of incorrectly using a common workaround? The Breakaway Group, a Xerox Company, has observed the workflows of health care organizations with various levels of EHR adoption. The research has led to an understanding of the key predictors of EHR adoption and revealed several telling trends surrounding documentation. For example, providers aren’t intentionally committing fraud; they simply are using classic workarounds to overcome poor workflows and a lack of education and training on the best practices for using the systems. • Lack of time: Time is a precious commodity these days. Recent federal mandates are driving a tsunami of technology changes that caregivers must adopt while caring for patients. Among these mandates is the HITECH Act, created to stimulate HIT adoption as a means to improve quality of care. Health care providers are scrambling to meet deadlines to earn related government incentives for fulfilling meaningful use of certified EHR systems. When attempting to expedite routine tasks, caregivers may cut corners; they likely are using the copy-and-paste function to minimize the time it takes to document visits. While copying and pasting can initially save time, the risk of fraudulent documentation can lead to hefty remediation efforts. In the long run, taking the time to properly train staff to use an EHR system will free more hours for health care providers to do what they do best. • Inadequate education and training: The Breakaway Group’s research found that traditional training approaches, such as event-based or instructor-led teaching in a classroom, often yield poor results for health care providers who don’t have time to attend classroom sessions and often don’t learn what they need even when they do attend. It’s time to revolutionize how health care providers learn new systems. Training typically focuses on the system’s functionality as opposed to task completion by role. To effectively grasp the material, staff members should be given the opportunity to practice scenarios specific to their use of the system. When designed correctly, provider education can be achieved in five- to seven-minute learning sessions that result in dramatically better retention and overall proficiency. • Cumbersome workflows: Oftentimes, health care organizations don’t conduct a workflow analysis when an EHR system is implemented. Observing how staff members perform their work helps organizations determine effective best practices and workflows moving forward. This analysis, which should be ongoing, is an important tool throughout the lifecycle of an application. • Leadership and engagement: Leaders of these initiatives must engage caregivers in defining the processes and ensuring they can use the new technology to provide care. When a health care organization struggles to adopt new technology, it often blames caregivers for resisting change. While it’s true that caregiver resistance can slow adoption, such attitudes are more a reflection of how unprepared the organization is for change and how it has chosen to educate its staff. Resistance often is a symptom of a lack of leadership engagement and poor training, making it imperative for organizations to establish a culture of adoption and provide effective education. • Providers proficient in workflows and processes by role: EHR education must be tailored to provider role. Traditional training methods, such as classroom learning, can result in clinicians sitting through hours of training for functionalities they may never need or use. Instead, think flight simulators for health care. The Breakaway Group has found that hands-on, simulator-based training customized to the roles of clinician groups simplifies the learning process, enabling staff to train quicker so they can focus on their core responsibility of patient care. Simulators allow practice in a real-life environment without real-life risks and consequences, and the hands-on training engrains the process. Simulators enable caregivers to practice in their actual EHR system and perform common tasks specific to their job, including entering orders, documenting exams, and administering medications. Ultimately, achieving proficiency in role-based tasks shortens the learning curve and boosts provider confidence and acceptance in using EHRs. • Measurement: Organizations should measure both clinical and financial outcomes to track adoption progress. Metrics must be identified as indicators of whether provider EHR use is improving, staying the same, or declining. • Sustained adoption over time: Adoption is never static; EHR usage can fall or rise seemingly indiscriminatingly within an organization. Leadership must invest in the people and processes required to sustain high levels of adoption over time. The Breakaway Group’s observations of successful EHR adopters reveals that well-designed templates can save time and overcome clinicians’ tendency to copy and paste. Templates can be customized to document a health care organization’s specific patient or visit type. Some caregivers may dislike the template-driven approach, but resistance often can be overcome by allowing them to participate in template creation, thus ensuring the tool meets their needs. While filling out templates is more time-consuming than using existing notes and training creates additional obligations, the chances of providers committing fraud and making mistakes that impact care are diminished. As technology continues to play a greater role in health care, the industry must call on organizations to do more than just install EHRs; the tool must be put to good use. This approach dramatically improves the benefits of EHRs and ensures providers don’t have to resort to workarounds such as copy and paste. — Heather Haugen, PhD, is managing director of The Breakaway Group, a Xerox Company, which focuses on optimizing HIT adoption.